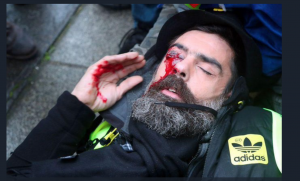 Each week that passes shows the French State deploy greater savagery against the Gilets Jaune (Yellow Vests) movement. Those people taking to the streets of French towns and cities are at risk of suffering severe life changing injuries as these images so vividly illustrate. 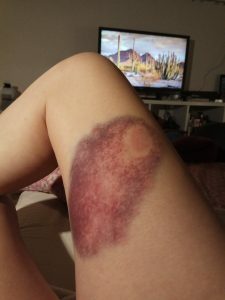 Flash balls, the weapon of choice of the French Police, are being fired at protestors, often at very short distance, and the impact on the human body is all to apparent. The question we need to ask is WHY is the legacy media so muted about this violence carried out by State forces against French citizens? WHY so sanguine? Ordinarily, such overt and fearful persecution of citizens protesting against their Government would attract the attention of the global mainstream media but this has NOT proven to be the case in France. The first few weeks of protests did attract the legacy media but then Macron and his allies declared that they had reached out to the protestors, made concessions, and thus the crisis was over. Except it wasn’t and the protests can be seen each weekend right across France with huge crowds on the streets. The scale of antipathy towards Macron is vast and constitutes a major threat to this globalist shill. The British media, in particular, seems disinterested, if not entirely relaxed about what is happening in France just a few miles across the Channel. This flags up a historical analogy. I’m old enough to remember vividly the media condemning the Royal Ulster Constabulary and the British Army when they faced petrol bombing and all sorts of missiles raining down on them from violent rioters in Northern Ireland.They responded by using rubbet bullets and then, at a later stage, plastic bullets. It seems to my recollection that there was huge saturation coverag from nearly every media outlet imaginable. It was all over America, The Roman Catholic Church, Amnesty International and umpteen other voices were howling in anguish against Plastic Bullets (earlier it was the rubber bullets). 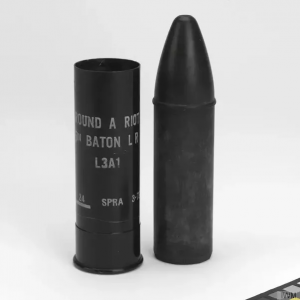 Now there is no mistaking the fact that Plastic Bullets could indeed be a fearsome weapon, inflicting injuries of clinical significance. The accuracy of the missiles was relatively primitive at the time and their use was relentlessly challenged. The media were all over this for 35 years! I can also remember the apoplectic incandescent rage of Bishop Cathal Daly on the TV concerning the role of the security forces using these missiles. Back then, there was sustained and universal media and selective political outrage. But now, all these decades later, the extreme violence deployed by the French security forces against the Gilets Jaunes is met with studied silence! Why the contrast? Rubber bullets in Northern Ireland deemed beyond the pale, flash balls on the Champs Elysses now invisible. Might it be that globalist Macron is calling in the favours from the tamed biased media and they are obliging? Is this another instance of the fake news choosing to mute news that does not suit a broader political agenda? Is this brutality against French citizens deemed un-newsworthy? If so, who decides and WHY? SPAIN’S SOCIALIST GOVERNMENT TO COLLAPSE?